I like table tennis robots. Not everyone does, but I think they can be very useful if you use them in the right way. My table tennis robot (Robo-Pong 2050) has helped me improve several areas of my game, including my topspin technique, rallying skills and footwork. 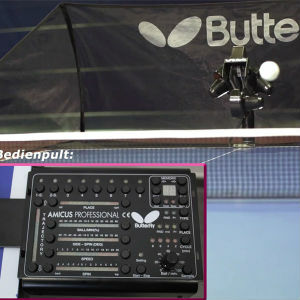 Without doubt, I have become a better player by using my robot (for more on my views on using a robot, read my blog post ‘Can a table tennis robot help you improve?’). In this blog post, I look at the different types of table tennis robots you can buy. I’ve split robots into three different categories: entry level robots, mid-range single-spin robots and top-of-the-range multi-spin robots. I also make recommendations on which table tennis robots I think are the best and give links to where you can buy. 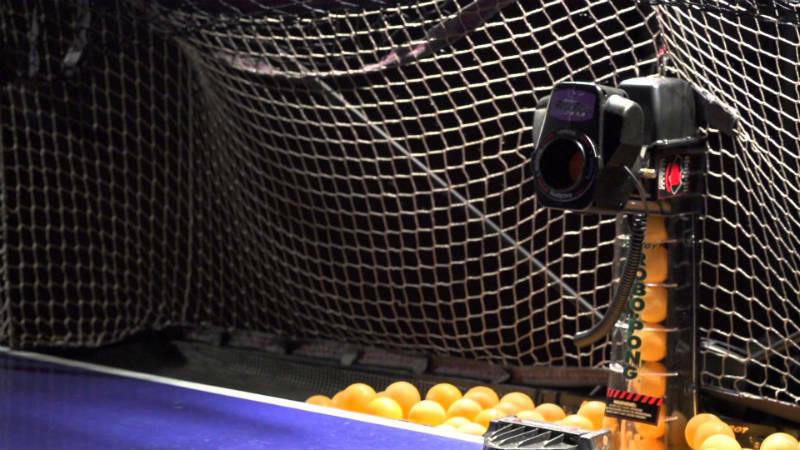 What can a table tennis robot actually do? First of all let’s look at what a table tennis robot is capable of doing. Some come with just a few basic features, others are like powerful computer systems with loads of speed and spin variations and programmable training drills. Ball frequency: You can change the frequency the robot shoots the ball at you. Most robots are capable of shooting 80 balls per minute. Some can do well over 100 per minute. That’s a lot of balls! Placement: You can choose where the robot shoots the ball. Some basic robots may only shoot to two positions. Better robots can shoot balls to multiple positions and can switch between positions for each ball. Speed: You can choose how fast the robot shoots the ball. Some robots can vary the speed of the ball. So you may get one slower ball and then one faster ball. Spin variation: You can choose whether the robot shoots backspin, topspin, sidespin or float. Some of the entry level robots may not be able to do all of these. But the mid-range single-spin robots will be able to. And top-of-the-range multi-spin robots can also change the spin with each ball, which gives a more realistic table tennis playing experience. Random play: You can get your robot to shoot balls in a random order. This could be random placement, random speed or random spin or everything completely random. Again, entry level robots will have more limited randomisation options. Whereas top-of the range robots will be able to do a lot more randomisation. Service: You can tilt the robot head downwards, so that the ball bounces on the other side of the table first, replicating a table tennis serve. Pre-set training drills: Some robots will come with pre-set training drills, where the robot will shoot the balls in a set sequence. Some pre-set training drills will also include a random element. Programmable training drills: Some robots will allow you to programme your own training drills. You can choose the specific sequence of balls the robot shoots at you. Ball recycling: Some robots (mainly mid-range or top-of-the-range), will come with a ball recycling facility, which is basically a collection net which funnels the ball back into the robot. This means that you don’t have to keep stopping to reload the robot. You can have continuous play. Of course, not every table tennis robot can do all of the above. So you need to work out which features are important for you before purchasing. It’s not essential to have a robot which can do everything imaginable, but I think you will get the most out of a robot if you can (at a minimum) change the speed, spin, placement and do some random play. Entry level robots are best suited to a beginner player. They tend to have a few basic features, like being able to change ball frequency, placement and spin, but won’t have pre-set training drills and may not be able to do random play. They are usually much smaller than mid-range and top-of-the-range robots. This has pros and cons. They are easier to set up and take less storage space. But as they are smaller, they don’t hold as many balls. So you will spend more time reloading your robot. 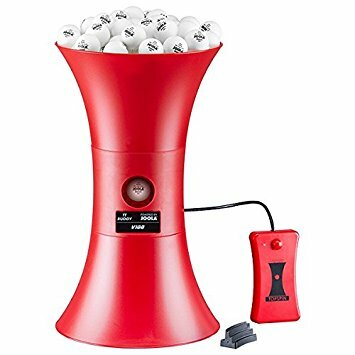 If you just want a robot so you can hit a few balls without doing anything complicated, an entry level robot will be good for you. Mid-range single-spin robots have plenty of features to test both intermediate and advanced players. 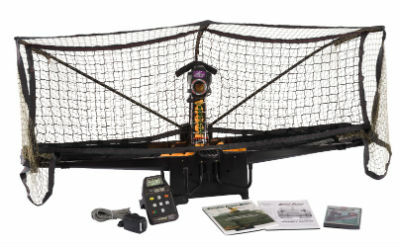 They have settings to change ball frequency, ball speed, and ball placement. They can also shoot the ball in a random sequence. Some robots, such as Robo-Pong 2050, come with pre-set training drills and allow you to programme your own training drills. So these robots offer much more than entry level robots, but they are more expensive. The biggest limitation of these robots is that they only can only produce one type of spin at a time. So any drill you do will be with the same type of spin, e.g. always topspin or always backspin. This isn’t a disaster by any means. There is still a lot you can do with this type of robot. I have a Robo-Pong 2050 and I have been able to do lots of practice looping backspin balls and playing topspin rallies. These robots are fabulous, as you would expect with the hefty price tag. They can do everything a mid-range robot can do, but more of it. More speed variation. More placement variation. More training drills. More everything! And of course, the really big advantage of these robots is that they can produce a different spin with each ball in a sequence. So the robot can shoot a backspin ball, which you loop. It then shoots a topspin ball, which you topspin/drive/hit (whatever your preferred playing style). This more closely replicates what actually happens when you play table tennis. A top-of-the-range multi-spin robot can be used by any standard of player, but advanced players will probably get most benefit from all the extra features. Expensive – your bank balance will take a dent! You can buy a table tennis robot from many specialist table tennis shops. Take a look at my list of shops in UK, USA, Europe, Asia and Australia. I hope this blog post has helped you make a decision about which table tennis robot to buy. If you do buy a robot, please let me know in the comment box below and share your thoughts on the your model. I’m sure it will help others who are thinking of buying a table tennis robot come to an informed decision too. Any thoughts on the up and coming Trainerbot ? It seems to have many of the functions the more expensive ones have; controlled via your smartphone and at a nice price. I saw you have the Newgy 2050, I’m wondering what is head angle setting you have for practice forehand and backhand as well as serving? I have to set mind to #8 and the ball speed is 15-18 (for Normal) to practice topspin but sometimes balls still hit the net. I think I have my robot set to a similar angle and speed. But if the balls sometimes hit the net, I make small adjustments to ensure the balls clears the net with a bit more margin. I also find that if I use a mix of balls in the robot, the lower quality balls may not come out a bit lower. So I try to make sure all the balls are the same and then the feed from the robot is consistent. How long does table tennis robot work newgy 2050. And if they are not working then a normal electricians will be able to repair it??? Hi, I have had my Newgy 2050 for 5 years and have had no problems. So no idea if a normal electrician would be able to fix. But it is a very reliable robot, so hopefully it will work for a long time. Hello Tom, thanks for sharing your knowledge. Does your Newgy Robo-Pong 2050 have various levels of difficulty for backspin, side-spin etc? That is, if set to the most difficult level (ie to the highest spin that it can produce), can I assume that it will be difficult for a beginner/medium player to return the ball? (meaning that it will give him a good challenge). Also, does it only allow for top-, left-, right- and back-spin, or are you able to allow for a 45-degrees-spin for example? (is this the “float” you are referring to?). I am very weak in answering my opponents’ service, and this is the main reason for which i am thinking to buy a robot. Hi! The robot can generate lots and lots of spin – backspin, sidespin, topspin – probably more than you are likely to face from a real opponent. And you can adjust the dial to get side-backspin or side-topspin. Only thing I will say is this robot (or any robot) probably won’t help you improve returning serves that much. This is because robots can’t do realistic serves. So much of returning serves is reading the spin and getting used to various service actions. The only way you get really good at returning serves, is getting other players to serve at you again and again and again. Or get some coaching / advice from a more advanced player.